Silver Valley Veterinary Clinic & Benewah Veterinary Clinic provide wellness programs for cattle, horses and other large animals. Once an animal is in our system you will receive a reminder in the mail when the next vaccine is due. Large animal care can be provided at our clinics or for an additional fee an outcall may be scheduled for your convenience. The following list is our protocal for basic annual health care. If you do not see the information you are looking for please contact one of our clinics. Bulls that need to be vaccinated should be done at this time. Vaccination with IBR-BVD-PI3-BRSV plus (+) or minus (-) Vibrio and Lepto depending on the area and individual herd (make sure products are killed viruses or chemically attenuated, ie. Cattlemaster4 or Cattle master 4VL5). West Nile Virus vaccine at 4 months, booster 4 weeks later. Pregnant mares should be vaccinated with a 3-way or 4-way 4-6 weeks prior to foaling. Pregnant mares should be vaccinated with rhino (killed vaccine - Pneumobort K) in the 5th, 7th and 9th month of pregnancy. 4-way or 5-way vaccination yearly. 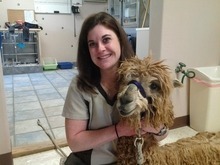 SVVC employee, Kristen Jacobson with an alpaca patient.